Shopping for light bulbs used to be as simple as picking a bulb with the correct wattage and a base that would fit into your fixture. Today, there is an overwhelming array of choices on the market, ranging from cheap replacement bulbs to smart light bulbs that are Wi-Fi enabled and let you change the color and brightness from your phone or tablet. Given that incandescent bulbs have been phased out for the most part, you eventually will have to start considering other options on the market even if you do not want to change your lighting yet. Whether you are looking for a basic bulb to replace your incandescent ones or want something a little more advanced, energy efficiency is the most important factor to consider. Halogen, light-emitting diode (LED), compact fluorescent lamp (CFL) bulbs and hybrids of these types are all more efficient than the standard incandescent bulb, with some of these options using up to 80 percent less energy. Review your best lighting options below and find out which bulbs will give you the most value and longest lifespan. Why should I switch from incandescent bulbs? Before comparing the different light bulbs available, it helps to understand the difference between incandescent bulbs and the more energy-efficient options on the market. Incandescent bulbs work by heating a filament, but they lose about 90 percent of their energy emitting heat in the process. These bulbs also do not last very long, with most burning out in about a year with consistent use. For this reason, most styles of incandescent bulbs are slowly being phased out, and soon you will not be able to find these in stores once the stock on hand is sold. Incandescent bulbs may be what you are used to, but there is no need to stock up on an outdated technology when there are better options out there. If you are hesitant to switch, it is worth noting that many energy-efficient bulbs will provide the same lighting effect as your traditional incandescent bulbs. While there are several varieties of light bulbs that give off a cool, almost bluish light, there are plenty of options that still provide the soft yellow glow you get from an incandescent bulb. What are the best energy-efficient light bulbs on the market? Halogen, CFL, hybrid CFL and LED bulbs are all energy-efficient choices worth considering. There are countless options available on the market, but some types and brands offer a better value than others. When choosing your next bulbs, consider the pros and cons of these four types of bulbs below. Halogen lights are very similar to a traditional incandescent bulb, but they are lit by a capsule filled with gas and a filament. If you are reluctant to switch from your standard incandescent bulbs, a halogen bulb is a slightly more energy-efficient option and you are unlikely to notice the difference when it comes to the light if gives off. In fact, you may even hear these bulbs referred to as halogen incandescents because they are so similar to those types of bulbs. The benefits of halogen lights are that that they are dimmable, provide instant brightness and come in just about any shape or size you need. Although halogens are a good step toward energy efficiency if you are just starting to transition over, it is important to be aware that these bulbs are not significantly better than standard incandescent bulbs. A halogen bulb uses about 25 percent less energy than an incandescent bulb, which will give you a little bit of energy savings. However, these bulbs still have a short lifespan compared to other energy-efficient options, with most bulbs only lasting for one or two years before they burn out. Compact fluorescent lamp (CFL) bulbs are much like the long tube bulbs found in many overhead lights, but the fluorescent tube in compact bulbs is in a spiral shape instead. Many CFLs claim to have a lifespan of anywhere from seven to 14 years when used for three hours every day. However, with that in mind, a CFL’s lifespan will be shortened if you frequently turn the switch on and off. CFLs use about 75 percent less energy than a standard incandescent bulb, which can create significant energy savings. In fact, most CFL bulbs will pay for themselves within nine months. While they may be more efficient, there are a few drawbacks to keep in mind with CFLs. These bulbs are less popular than other types of energy-efficient options because they are not dimmable and they typically need a bit of time to warm up, which causes a delay before they are fully bright. CFLs are the only bulbs that take a while to get bright, which tends to give all energy-efficient bulbs a bad name. Another drawback is that CFLs contain mercury. Not only does this mean you have to recycle your CFLs responsibly, but it also makes for a challenging cleanup if you happen to break a bulb, as you do not want to breathe in any dust that may get stirred up in the process. If you want the instant brightness of a halogen bulb with the efficiency of a CFL, a hybrid bulb may be your best bet. When you switch on a halogen-CFL hybrid, the halogen component will light up first and switch off once the CFL component has warmed up. According to Consumer Reports, hybrid bulbs will help you save about $54 over the lifespan of each bulb. This is more than you would save with a halogen bulb alone but slightly less than the savings you would get from a CFL bulb. As a drawback, the lifespan of a hybrid bulb is cut short when you frequently turn it on and off. By far some of the best choices on the market are LED bulbs. LEDs provide the greatest energy savings, with most bulbs using 75 to 80 percent less energy than a standard incandescent bulb. On top of that, LEDs brighten instantly and last 15 to 20 times longer than regular bulbs, with most LEDs claiming to last a minimum of 18 years. When used at three hours per day, some models even claim to have a lifespan of up to 46 years. LED bulbs tend to work well with timers, and most of them are also compatible with dimmer switches. 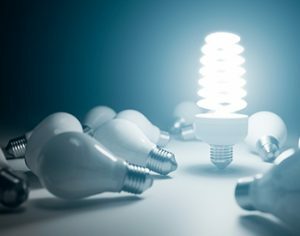 Another benefit of LEDs is that they have a reputation for working well in cold environments because they are more durable than other types of bulbs. One downside of LEDs is that some designs cannot cast light evenly in all directions. Another drawback is that many LED bulbs are expensive to buy, but it is important to take into account the energy savings you will get over the lifespan of each bulb.